La Mesa Healthcare Center is a premier skilled nursing and rehabilitation center located in La Mesa, California. We serve the community of San Diego County with state of the art rehabilitation services and a high quality of care while maintaining a comfortable and inviting environment. At La Mesa Healthcare Center our kind and encouraging setting is appropriate for individuals who are recovering from surgery or illness and require concentrated rehabilitation, or need continuous nursing care. 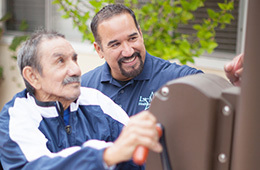 The Rehabilitation program at La Mesa Healthcare Center utilizes a holistic, patient centered approach to therapy. Our team of highly skilled Physical, Occupational and Speech therapists have advanced degrees and extensive experience in orthopedic conditions, neurological conditions, and various other medical conditions that create barriers to independence. We believe that every person is an individual; our residents are set up with therapy plans that are tailored to meet their specific rehabilitation needs allowing them to maximize physical functioning and independence. We welcome you to come see our friendly staff in action and visit La Mesa Healthcare Center today. All 90 beds are Medicare and Medicaid certified. We provide a full in-house rehab unit that offers: PT, OT, and ST.